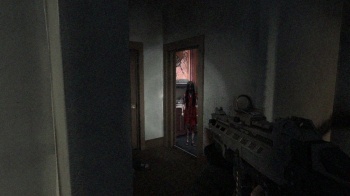 Horror shooter F.E.A.R. 3 has been pushed back yet again and is now scheduled to hit store shelves in May. F.E.A.R. 3, the FPS about a high-strung homeless guy, his dead brother, a mom with anger issues and the wacky antics that ensue during a family reunion, was originally supposed to be out in time for the 2010 holiday season. But in August it was pushed back into 2011 without explanation, with Warner Bros. Interactive Entertainment eventually settling on March 22 as the confirmed go date. You can consider that date unconfirmed, as a rumor that the game was being pushed back even further was confirmed by the publisher. "The F.E.A.R. 3 launch date will now be in May 2011, as we look to deliver the best possible game for our fans," a F.E.A.R. forum admin wrote. "Thanks for the patience, I promise it will be worth it." Warner confirmed the delay with the same statement sent to Eurogamer. It's interesting to note that while the scheduled March release was tied to a specific date - March 22 - Warner now only says that the game will come out sometime in May. It may mean nothing, or it may mean that things are a little less iron-clad than we all thought. On the upside, we'll all have more time to devote to the upcoming Crysis 2, which remains set for a March 22 launch. F.E.A.R. 3 will be released one of these days on the PC, PlayStation 3 and Xbox 360.